Belize NMS: A cool and relatively moist northeasterly airflow prevails over our area. 24-hour forecast: Sunny skies with a few cloudy spells today and partly cloudy skies tonight. A few showers will occur mostly over inland areas today and along southern coastal areas tonight. Today E-NE 5-15 kts Slight-Light Chop 1-3 ft A FEW SHOWERS NORTH. Tonight E 5-10 kts Slight 1-3 ft ISOLATED SHOWERS WITH A FEW MORE SOUTH. Tomorrow E-NE 5-10 kts Slight 1-3 ft A FEW SHOWERS NORTH. Outlook E-NE 5-10 kts Slight 1-3 ft A FEW SHOWERS MOSTLY SOUTH. A sharp upper-level trough is also over the NW Caribbean. Scattered moderate showers with isolated thunderstorms are over the NW Caribbean and Honduras N of 15N and W of 80W. The surface pressure gradient between a ridge of high pressure north of the Caribbean and the Colombian low is supporting fresh to strong winds across the south central Caribbean. Scatterometer data shows an area of 20 to 25 kt north of Colombia from 11-12.5N between 74W-77W. Broad high pressure NE of the area will maintain fresh to strong winds across the central Caribbean through mid week, diminishing some by the end of the week as the high weakens. The highest winds are expected near coast of Colombia at night. 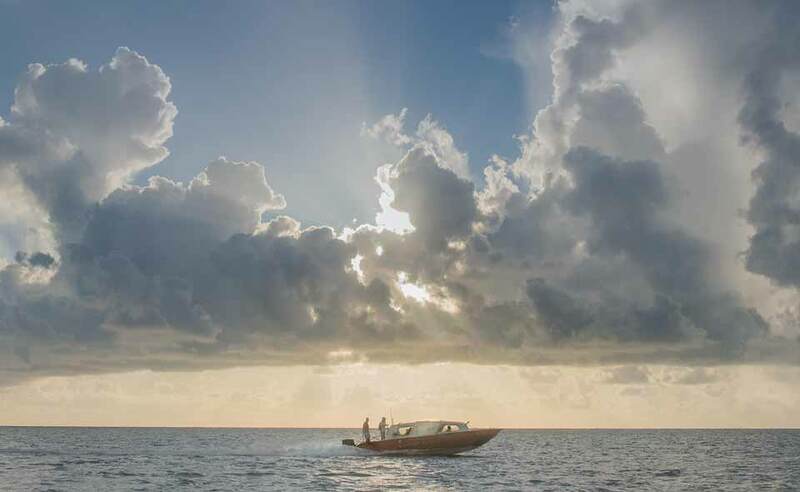 It's a beautiful morning on Ambergris Caye with a calm sea and a few rain showers here and there. The expected high temperature is in the low 80's. The NE Caribbean winds are fighting back against the cool air, causing several areas of rain down our coast and now some coming inland over Belize city and San Pedro, and probably some inland later this morning. Looks like the weather fight is now on, some places will have good sunshine, others clouds and some rain. The Cloud and rain picture. 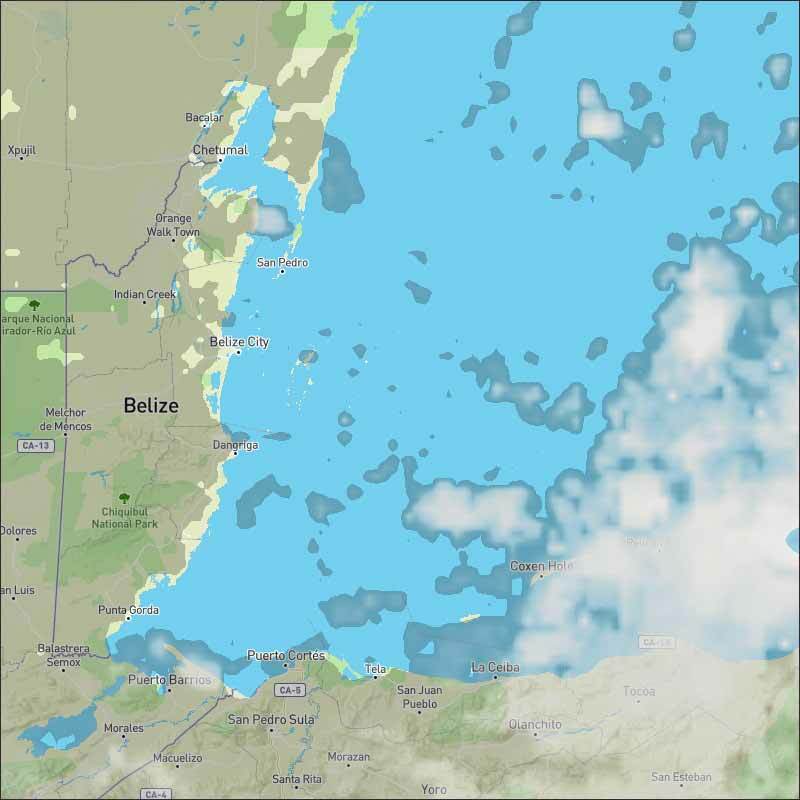 There was some rain on land, but although the rain is still coming towards Belize, much of it is drying up before it gets much inland, as the day warms up. 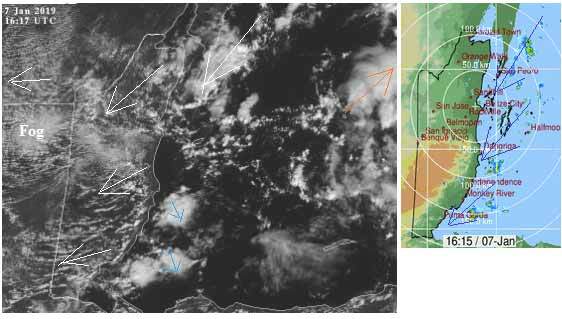 All the cloud as seen on the Satellite picture over Belize is now Caribbean cloud from the NE, and the surface wind we feel is from the east, but I saw some cloud earlier moving down from the north, and some seen on the satellite picture over the sea. There is high level winds from the SW, but only as clouds out at sea. The rain showers are not drying up, but increasing over Belize. Looks like there will be overnight rain in some part of Belize, some heavy. Probably a very mixed day tomorrow Tue 08 Jan with a strong possibility of some of those large Caribbean clouds moving in, with significant rain in some places, but with gaps between, so some strong sunshine from time to time. Do not go out tomorrow without suitable rain cover, you could get caught by what appears clear sky.